Lincoln Park Uncorked: A Lincoln Avenue Wine Stroll. 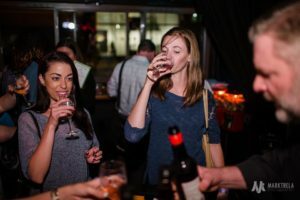 Lincoln Park Uncorked is a neighborhood wine stroll that combines delicious wine samples paired with local, complementary bites and showcases Lincoln Park businesses. 14 Wine Stroll stops including Baird & Warner, Best Vacuum, Bodega Ramos, Burnt City Brewing, Chicago CryoSpa, Foster Design Build, Lincoln Station, Red Lion Pub, Roots Family Chiropractic, Seder Orthodontics, State Farm Insurance, Victory Gardens Biograph Theater and Wink Optical. Restaurants offering complementary bites include Café-Ba-Ba-Reeba, Geja’s Cafe, Insomnia Cookies, The J. Parker, King’s Bowl Lincoln Park, Knife & Tine, Mon Ami Gabi, Stella Barra Pizzeria, Snarf’s, White Oak Tavern & Inn, and Vanille Patisserie. ArcLight Cinemas is hosting it’s fourth “Dinner & Movie” night, presented in partnership with Knife & Tine, 90 + Cellars, and Lyft. Beginning at 6 pm, attendees can enjoy dinner at Knife & Tine with drinks provided by 90 + Cellars, then have Lyft take them over to ArcLight Cinemas for the opening night of The Magnificent Seven (2016). Each ticket is only $41.50 and includes prix-fixe dinner, drinks, transportation from the restaurant to the theater, and admission to the movie! Aloha began with Tony Cavallario and Matthew Gengler in the summer of 1997 in Bowling Green, OH. The only Polyvinyl band to be signed based on a demo tape, the band has operated from a number of bases, variously doing their writing, rehearsing and living in Cleveland, Chicago, Washington D.C., Cincinnati, Rochester, Pittsburgh and Altoona, PA.
Fall is the perfect time to visit Green City Market to connect with local growers and buy the best of the season. Here’s a seasonal guide through mid-September which includes recipes incorporating seasonal produce. After shopping, head across the street to Hotel Lincoln to grab a cup of coffee at Elaine’s or lunch at The J. Parker. A hilarious coming-of-age story told by a first generation American woman of color. At some point, we all realize we are not exactly the person our parents expected us to become. How do we find our own voice and embrace our personal identity in the face of societal and familial pressures? Told with humor and deep insight, dynamic writer-performer Fawzia Mirza shares a journey of self-discovery and strength that carries her all the way from childhood as a Pakistani Muslim in small-town Canada to living out as an actress in the heart of Chicago. Told through the lens of two women’s shared love for glamorous Bollywood film star, Sharmila Tagore, using personal anecdotes, pop culture and even some South Asian history lessons, this is a profound and exciting new show about family, love, romance and finding yourself. Before the show, grab a drink and bite to eat at Front Bar. Here’s a link to their menu. Join the Cards Against Humanity late night writer’s room. You’ll pitch your card ideas to the game creators, and the best suggestions will be acted out live by the Nerdologues and friends. The worst suggestions will be mercilessly ridiculed. Celebrate #SundayFunday with a nightcap at Kingston Mines. The music is some of the best blues in Chicago and nonstop from 6:00 p.m – 4:00 a.m. Have dinner at Doc’s Rib Joint and then sit back and enjoy the music.